2019 The Astronomical Journal 157 104. Comparison of the heliocentric distances dCBJ estimated by Bailer-Jones et al. (2018) to the heliocentric distances dXue of Xue et al. (2014), for halo K giants ([Fe/H] < −1) in LAMOST data and within 4 kpc of the Sun. Upper panels: histograms of the ratio dCBJ/dXue shown in linear and log scales. 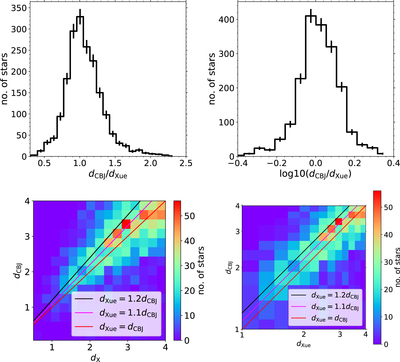 The histograms show a systematic difference between the two distance scales of 10%, in the sense that the Xue et al. (2014) distances are closer by 10% on average than those of Bailer-Jones et al. (2018). 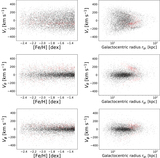 Lower panels: density map comparisons of the distances estimated by Bailer-Jones et al. (2018) to those of Xue et al. (2014). Note the axes are linear in the left panel and logarithmic in the right panel. The lines mark the 1:1 relation between the scales, and systematic shifts of 10% and 20% between them.